Knob Creek and pineapple? Absolutely! Knob Creek plays particularly well with pineapple – the big bourbon flavor is a great match for the sweet and sour fruit. 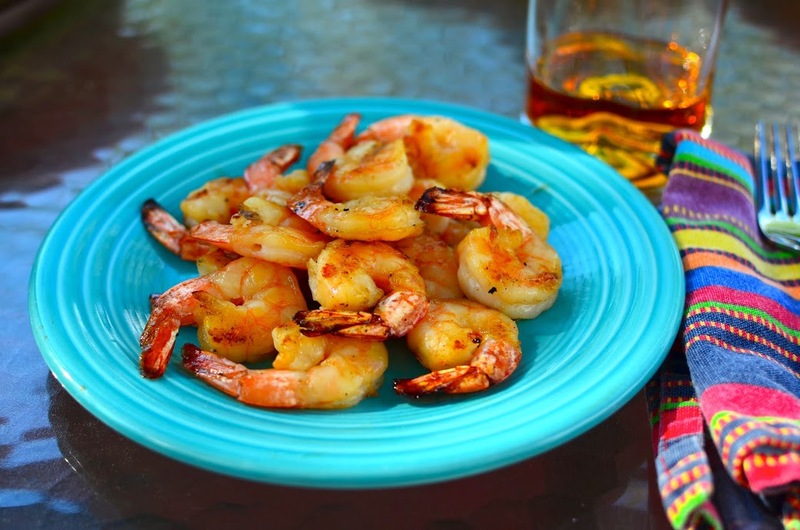 I layer those flavors on grilled shrimp, first as a marinade, then as a grilling glaze. Bland shrimp? Not when I’m done with it. These shrimp can be an appetizer or main course. 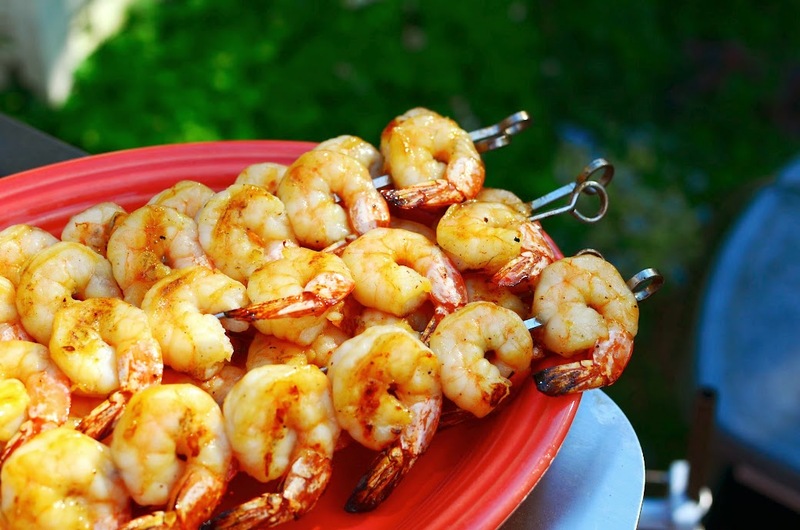 If I’m serving the shrimp as an appetizer, I use short skewers, with three shrimp per skewer. I serve the skewers hot off the grill. I made these for a party, and the smell of the grilling shrimp drew in my guests. I barely got them off the grill grates before they were devoured. For dinner sized servings, I use longer skewers with six shrimp per skewer. That should make eight skewers, which is enough for four people. Or one or two hungry guys. If you’re serving more people, get more shrimp. The recipe easily scales up; the only real work is skewering. 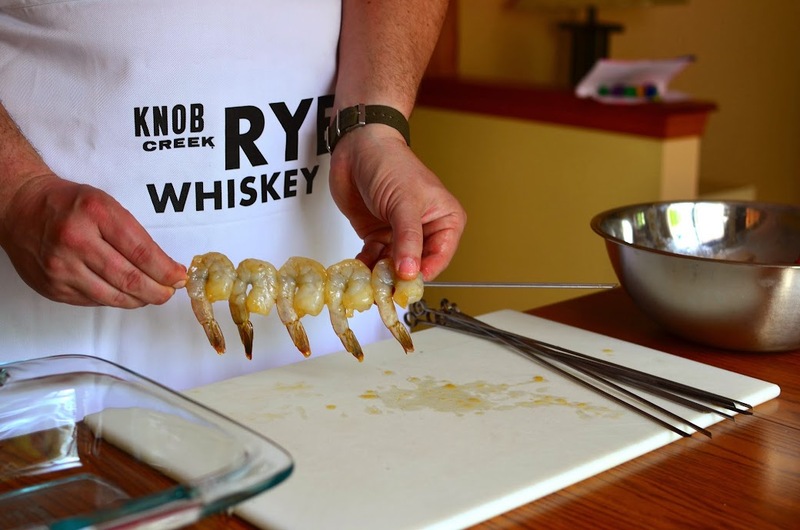 And, of course, the bourbon flavor in the shrimp makes these a great match for a glass of Knob Creek. Enjoy! Whisk the marinade ingredients in a medium bowl. Peel and devein the shrimp, put them in the bowl of marinade, and toss to coat. 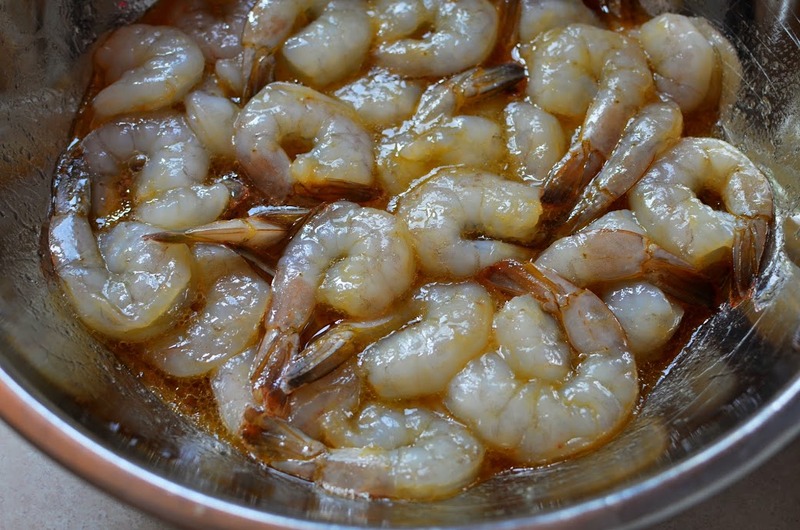 Marinate the shrimp for 30 minutes to one hour, stirring and tossing occasionally. I preheat my grill with all the burners on high for 15 minutes. Then I brush the grates with my grill brush and turn the burners down to medium-high. If you have a grill-safe basting pot, put the glaze ingredients in the pot, and put it in the grill while the grill is preheating to bring it to a simmer. Once the glaze is simmering, slide it off the heat and let it simmer while the shrimp is on the grill. Move it closer or farther from the heat as needed to maintain a simmer. My “grill safe pot” is an enameled steel camping mug. 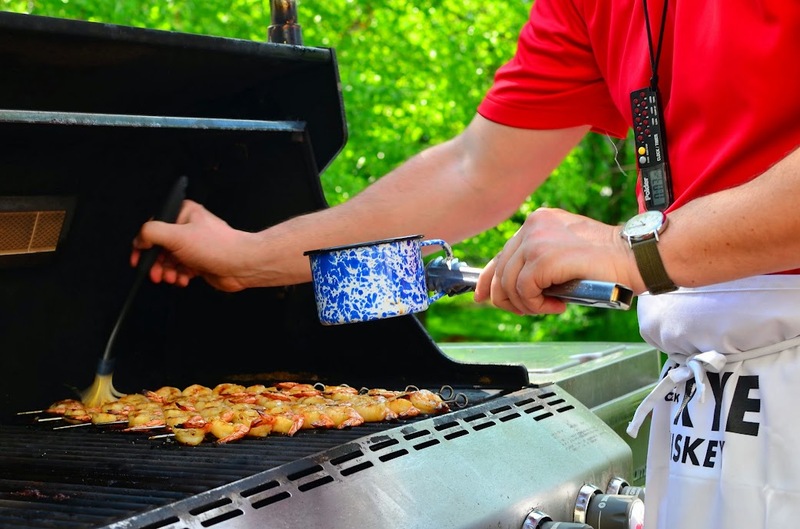 If you don’t have a grill safe pot, simmer the glaze on the stovetop until it reduces to a thick glaze. While the grill is preheating, skewer the shrimp, letting excess marinade drip off. Grill the shrimp over direct medium-high heat until browned, about 6 minutes. Brush the shrimp with the glaze a couple of times during the last two minutes of cooking. Put the skewers on the grill over direct medium-high heat, and cook for two minutes, or until the shrimp are starting to brown. Flip the skewers and cook for another two minutes, until browned on the other side. Brush both sides of the shrimp with the glaze, and cook for one minute to caramelize the glaze; brush both sides again with glaze, and cook for one more minute. Remove the skewers to a platter and brush one last time with the glaze. Let the skewers rest for five minutes, then serve.